The content of this website (www.thecareyexperience.co.uk), including, but not limited to, the textual content, pictures and site design, is protected by International Copyright Laws under the Creative Commons Attribution-NonCommercial-NoDerivs 2.0 UK: England & Wales License, unless otherwise specified. To view the license click here. For the purposes of the license, the author is 'The Carey Experience', unless another author is explicitly specified. 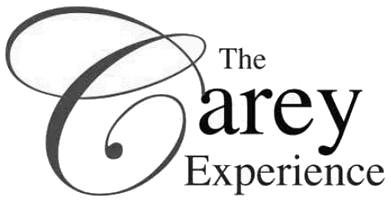 The Carey Experience has made its best efforts to ensure that the information on this website reflects the most accurate information, but we do not guarantee that it is accurate, up to date or complete in every respect. The Carey Experience may change or update this website, or links to other websites at any time. Links to other websites are provided for information and convenience only. Whilst we try to ensure all websites are appropriate, we cannot accept responsibility for the sites linked to, or the information found there. Please note that a link does not imply an endorsement of a site, and not linking to a site does not imply lack of endorsement.